rub Scéna horské divočiny s losem stojícím v řece a slova "Olympic Washington 2011 E Pluribus Unum"
Scéna horské divočiny s losem stojícím v řece a slova "Olympic Washington 2011 E Pluribus Unum"
5 oz 2011 Krásná Amerika | Stříbrná mince Olympijský národní park A memorable way to protect your savings and celebrate a beautiful mountain park! Olympic National Park in Washington State covers almost 1 million acres of land, starting at the Pacific coast with the Olympic Mountain range right in the middle of the park. The obverse of the coin features the John Flanagan effigy of George Washington, as it has appeared on US quarters since 1932. 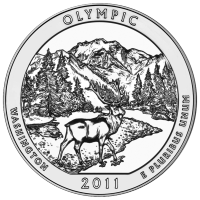 The reverse features a mountain landscape with trees, a river and an elk about to cross the river. The America the Beautiful series will eventually comprise 56 unique coins by the time the series is complete in 2021. These US Mint coins are a perfect way build your wealth in ounces by investing in a government minted product with a relatively low premium.